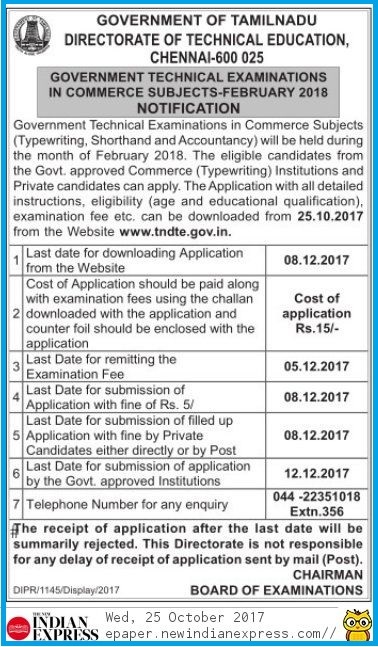 Government of Tamil Nadu, Directorate of Technical Examinations, Technical Examinations in Commerce Subjects (Typewriting, Shorthand, Accountancy) Notification 25.10.2017, The examinations will be held during the month of February 2018. The eligible candidates from the Govt. approved Commerce (Typewriting) Institutions and Private candidates can apply. The Application with all detailed instructions, eligibility (Age and educational qualifications), examination fee etc. can be downloaded from 25.10.2017 from the Official TNDTE Website www.tndte.gov.in.